Do you believe in fairies? 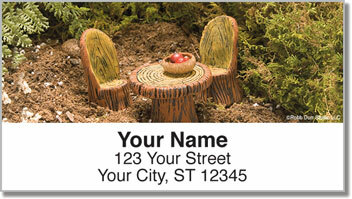 Are you always waiting to hear the beating of tiny wings or patter of little footsteps? Did you clap for Tinker Bell? 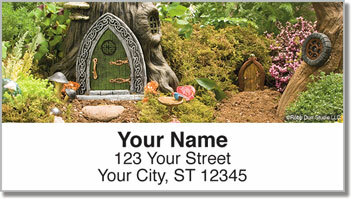 If you answered yes to any of the above, then you'll love these Woodland Fairy Address Labels from artistic husband/wife duo, Robb and Bette Durr. Both artists make these delightful scenes possible. 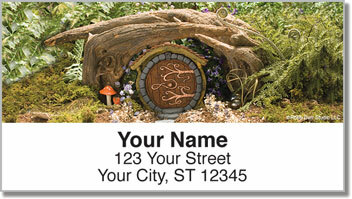 Robb sculpts and molds the fairy doors and then casts them in resin, and then Bette goes back and adds color with vinyl-based paint. 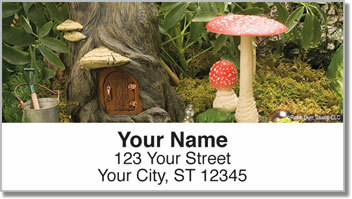 If you're longing to recapture the wonderment of youth, then order these Woodland Fairy Address Labels today! The fairies are waiting.